Whether your solar panels are being installed, maintained, repaired or cleaned, it’s hugely important that the technician you’ve chosen is accredited by the Clean Energy Council. In this blog post, we’ll explain the main reasons for this. When you hire a non-accredited person to work on your solar panels and something goes wrong, your warranty will be voided and your insurance company will not process your claim due to the worker’s lack of certification. There are many pop-up solar companies that have arisen from failed previous companies, so you can’t always assume a technician has the correct accreditation. It’s best to play it safe by confirming this before any work is carried out. Accreditation from the Clean Energy Council ensures a technician knows the best practices to keep themselves, the homeowner and anyone else safe during their maintenance or cleaning work. If you contract someone who isn’t accredited, you could be putting yourself at risk – as well as anybody who is on or near your property. There’s also the risk that an unqualified worker could harm or even electrocute themselves while working on your solar panels. During our years of servicing solar systems we have found cases of solar panels causing shocks and the potential for disaster is serious with a chance of death, which is definitely not an ideal situation to find yourself in. If a cleaner or technician doesn’t understand exactly what they’re doing, their work could put your solar power system in jeopardy. 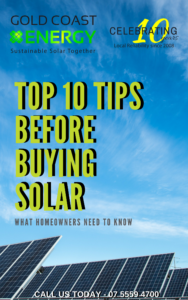 Remember that your solar panels are a long-term investment; they need to be treated properly and maintained by the right people in order for you to get the most from them. For example, you won’t get to fully enjoy the benefits of cleaning your solar panels unless they’re cleaned by an accredited professional. You can view all our accreditations here or alternatively, get in touch with our friendly team and we’ll discuss your questions and requirements with you.